A view of the north side of the chapel of Hinton Priory in Somerset. Hinton Charterhouse was one of the first Carthusian monasteries in England. It was founded in 1232 by the Countess of Salisbury. The monastery was dissolved along with other religious houses in the 16th century. 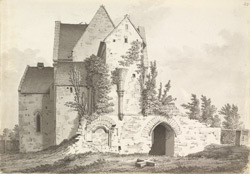 In the late 18th century, when Grimm visited here, many of the monastic buildings were still standing. The refectory undercroft, the chapter house with library above and parts of the guest house survive today.